The Eero online store provides a system of 3 optimum wifi routers working in unison to deliver hyperfast Wifi to every corner of your house, virtually eliminating the process of buffering or lag in internet connection. Being the world’s first home wifi system, Eero explains how a single wifi modem has trouble going through walls in order to reach every corner of your house, providing you with a mesh of routers to ensure hyperfast connectivity. With Big Apple Buddy’s personal shopping service, you can now buy directly from the Eero online store anytime, anywhere. The great thing about Eero's home wifi system is that you only need to plug one device into your modem with the other two only needing power outlets in order to amplify internet connectivity. Eero requires an extremely simple setup on your device, and automatically downloads the latest security features to spare you the trouble of manually checking it yourself. With it being extremely easy to overshare on a guest network to friends and family, the Eero wifi system automatically updates itself without you even noticing. You can monitor all the devices operating your wifi and keep tabs on the speed they clock through your cellphone. 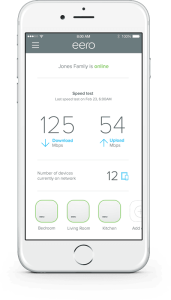 Unlike most other wifi networks, Eero’s performance actually improves over time due to its ability to automatically install the latest updates. Eero is a state-of-the-art wifi service that’s guaranteed to work at hyperfast speeds in any corner of your home, over a long period of time. Unfortunately, the USA Eero online store only ships certain brands to select countries. However, Big Apple Buddy, your personal shopper, can help you buy products directly from the official USA Eero online store and ship them to your doorstep, no matter where you are in the world. If you would like to buy from the USA Eero online store, simply let us know which items you would like to order (by filling out the form below) and we’ll get back to you with a free international shipping quote within 24 hours!